The first printed photo using a halftone, December 2, 1873. Առաջին իրապես հաջողված կոմերցիոն մեթոդը արտոնագրել է Frederic Ives-ը Philadelphia-ից 1881թ. : Չնայած այն բանին, որ նա գտել է պատկերը տարբեր չափսերի կետերի բաժանելու ճանապարհը ,բայց նա չէր օգտագործում էկրանը: 1882թ. գերմանաի Georg Meisenbach -ը արտոնագրեց halftone գործընթացը Անգլիայում: Նրա գյուտը հիմնված էր նախորդ գաղափարների Berchtold և Swan-ի գաղափարների հիման վրա : Նա առաջինն էր ,որ halftone-ի օգնությամբ հասավ առեւտրային հաջողությունների . Halftoneպրոցեսի պարզությունը իմնական հաջողությունն էր : Կիսատոնի մեջ բլոկների օգտագործումը հայտնի ամսագրերում դարձավ ռեժիմ 1890-ականների սկզբներից :. Էկրաններ ստեղծելու առավել տարածված մեթոդըամպլիտուդաըին մոդուլյացիա,որը արտադրում կետերի ցանց ,որոնք տարբերվում են չափերով :Մեկ այլ միջոց էկրանի ստեղծման հաճախականության մոդուլյացիան է ,որը հայտնի է նաև պատահականային էկրանավորում : Մոդուլյացիայի երկու մեթոդները անվանում են հեռահաղորդակցության անալոգիա տերմինաբանության ոլորտում : . Կիսատոն էկրաններիը բանաձևը չափվում է մեկ դյույմ գծերով (lpi): Սա կետերի տողեր են ,արանցից ամեն մեկը մեկ դյույմ է , չափված էկրանի զուգահեռ անկյունից : Known as the screen ruling, the resolution of a screen is written either with the suffix lpi or a hash mark; for example, "150 lpi" or "150#". Three examples of color halftoning with CMYK separations. 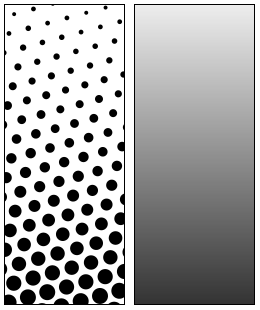 From left to right: The cyan separation, the magenta separation, the yellow separation, the black separation, the combined halftone pattern and finally how the human eye would observe the combined halftone pattern from a sufficient distance. 1980թ. կիսատոնը արդեն հասանելի է նոր սերնդին imagesetter ֆիլմերի և թղթի գրանցողներն , որոնք մշակվել են ավելի վաղ շիջանում "լազերային գրաշարերով ":Ի տարբերություն մաքուր սկաներներին կամ մաքուր գրաշարերին imagesetters-ները կարող են տպել էջի բոլոր տարրերը ,նկարները և գրաֆիկական այլ պատկերներ : Վաղ օրինակներ լայնորեն կիրառվում էին Linotype Linotronic 300 և 100 մտցվեցին 1984թ. ,որոնք առաջինն էին 1985թ. PostScript RIP-ի առաջարկածից : . ↑ 1,0 1,1 1,2 Campbell, Alastair. The Designer's Lexicon. ©2000 Chronicle, San Francisco. ↑ McCue, Claudia. Real World Print Production. ©2007, Peachpit Berkeley. ↑ 3,0 3,1 3,2 3,3 3,4 Twyman, Michael. Printing 1770–1970: an illustrated history of its development and uses in England. Eyre & Spottiswoode, London 1970. ↑ LIFE. "100 Photographs That Changed the World". Time, Inc. August 25, 2003, p 18. ↑ 5,0 5,1 Meggs, Philip B. A History of Graphic Design. John Wiley & Sons, Inc. 1998. p 141. ISBN 0-471-29198-6. ↑ August Hoen, Composition for etching stone, U.S. Patent 27,981, Apr 24, 1860. ↑ August Hoen, Lithographic Process, U.S. Patent 227,730, May 15, 1883. ↑ August Hoen, Lithographic Process, U.S. Patent 227,782, May 18, 1880. ↑ Kay Johansson, Peter Lundberg & Robert Ryberg, A Guide to Graphic Print Production. 2nd ed. Hoboken: Wiley & Sons, p. 286f. (2007).